les longs sont'ils en mesure de contre attaquer ? résistance très difficile à franchir , et qui fait barrage depuis octobre 2010 ! l'argent cotait à ce moment là, 24 $. C'est vraiment pas le moment de flancher, là ! Sachant qu'en cas de short squeeze des commerciaux, cette résistance ne sera pas franchie. l'open interest ( positions ouvertes ) sur les futures de l'argent métal a dépassé les 140.000 contrats . 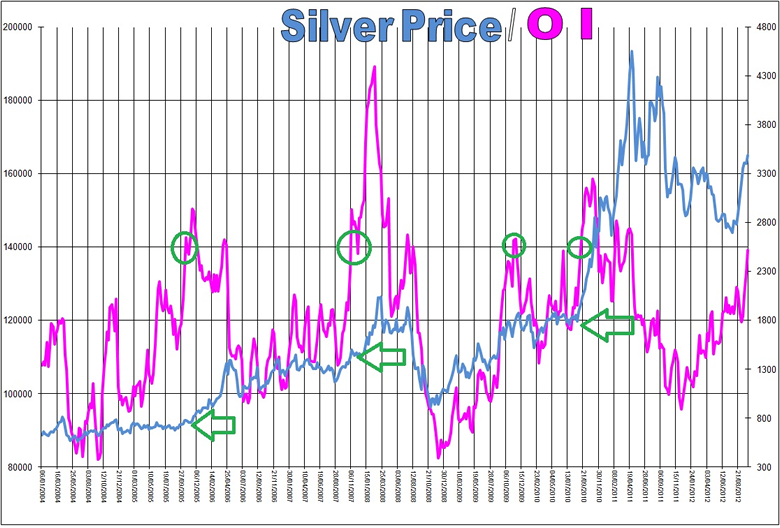 During periods of rising Open Interest, it seems the main/only effective way that the Commercials have been able to stem/cap the rise in Silver Price has been to increase their Short Side aggressively. However it does truly seem that there are limits to the Commercials ability/willing to continue piling on the Shorts aggressively over and above the rise in Open Interest. Historically this has seemingly co-incided with a rise in OI above 140,000. In the last week or so Open Interest for Comex Silver has risen to 140,000 which suggests strongly from an historical context that should it continue to rise, the Commercials are going to back off their aggressive shorting, which should result in an acceleration in the rise of the Silver Price thereafter. It therefore looks very much to me that the Commercials are now ‘Fully In’ in this Game of Poke, If they can’t flush out other members round the table at this juncture, they will have little choice but to stand aside, The Spike Ups of 2005/2006, 2007/2008 and 2010/2011 are all testament to similar periods when the Bully’s Bluff was finally called! au vu de l'excellente cloture de ce soir, avec l'argent à nouveau au dessus des 34 $, ( 34.07$ ) cela semble de très bon augure . à surveiller donc attentivement sur les prochaines séances, avec les chiffres open interest ! mauvaise nouvelle pour l'argent : l'open interest est repassé sous 140.000 contrats depuis 3 séances ( cad depuis le mercredi 24 octobre); pour s'établir à 137977 contrats le je 25 octobre . 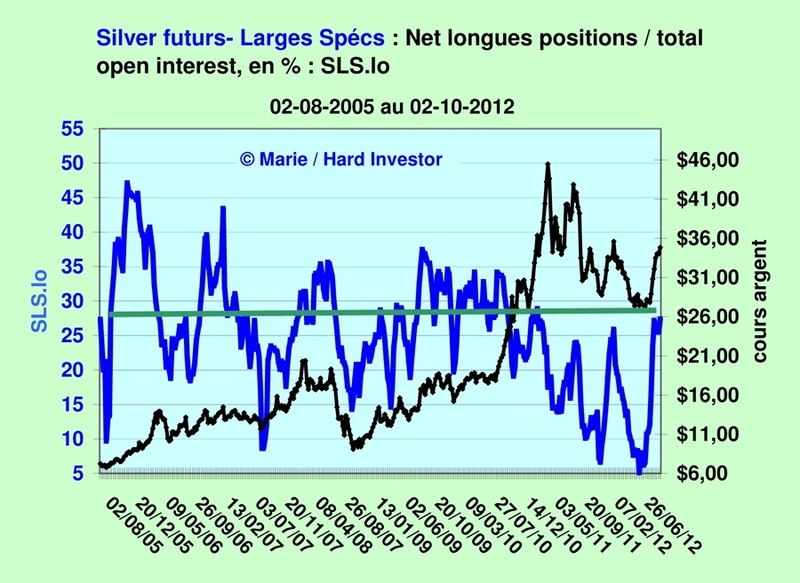 open interest silver passe la barre des 150.000 contrats ! OI up another 619 on Wednesday's Action to 150,954!.. Let's take another look at that graph shall we?!?.. On the 3 previous occasions when OI stretched up to 150,000 after months of corrective contraction, Hi-Ho ramped between 50-120% with the next 6-8 months!.. On Wednesday the silver o/i hit 150.9k. Interestingly, given that we're in the contract "roll" period when o/i usually declines driven by front-month selling by hedge funds, on Wednesday the Dec contract dropped by 2975 and the March contract - the next front-month contract - increased by 3,248. This whole period, more contracts have been rolling than liquidating - roughly 10k more so far - as evidenced by the increase in open interest over the past week. This is very bullish - the cartel has failed so far in trying to trigger a COT liquidating sell-off. This tells me that strong hands on the long side are in charge. This is somewhat unique to this bull market for silver. Think they want to make sure gold stays below 1800 by Tuesday's option xpiry? The open call interest t 1800 is 32,489 vs 4419 open puts. I've never seen the call/put o/i this lopsided at a specific strike price. LOL. The rest of the call/put distribution is mostly "balanced" with 1800 looking to be the only manipulated strike price.